Whereas social media monitoring collects and enumerates social mentions and interactions in the newsfeed, social media listening analyzes the data collection. While social media monitoring serves as an analytics tool to enumerate social media interactions, social media listening is a tool to expand genuine interactions on social media and develop new interactions. Instead of simply tracking conversations around specific keywords and industries, social media listening showcases the content of interest to the audience and helps the business develop content relevant to those conversations. Social media listening is important to showcase how well a business genuinely listens, understands, and relates to its audience. Brand development, marketing idea generation, and improved customer experiences can be enhanced with this knowledge. developing a customer-centric inbound marketing approach throughout all departments. Additional resources for PR and media directors can ensure that more time is spent engaging with the audience and potential customers on social media. Although these directors spend the most time with social media channels, it is important that all business departments (sales, marketing, media, customer service, etc) develop a customer-centric inbound marketing approach by engaging and working with potential customers according to their needs. Since many individuals discuss pain points on social media, businesses can use social media listening to relate to their audiences’ pain points, help develop solutions, and generate content of interest and relevance to their audience. A strategic and cost-effective social media listening program involves at least one person dedicated to regularly monitoring social media newsfeeds and interacting with the audience. Trending hashtags and common references in the newsfeed should be monitored for connections to the business, brand or mission and relevant content generated to maintain the interest of the audience. To give a strong example of social media listening, the KNB Communications’ Twitter newsfeed was flooded in June with pictures of the #BlackAndWhiteChallenge, as well as posts on mental health and suicide prevention due to recent celebrity deaths. 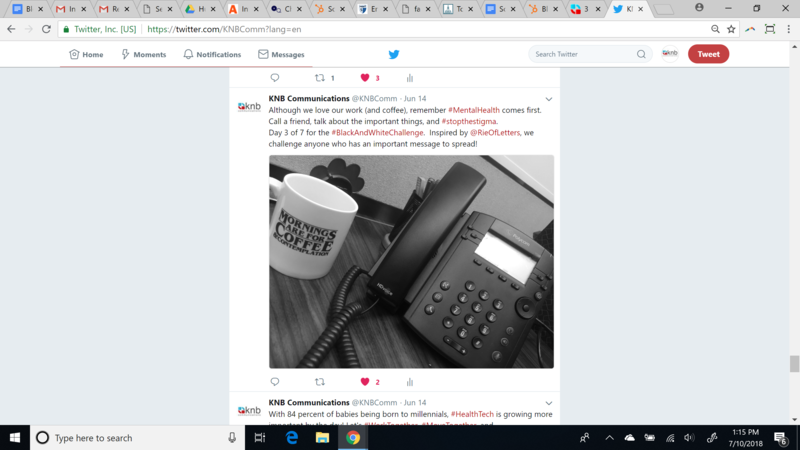 As KNB Communications is a public relations and marketing company focused on the healthcare and healthcare technology industries, KNB used its social media listening skills to develop one #BlackAndWhiteChallenge post each day for a week, following the challenge’s rules but also using the challenge to share important messages on the topics of mental health and suicide prevention.